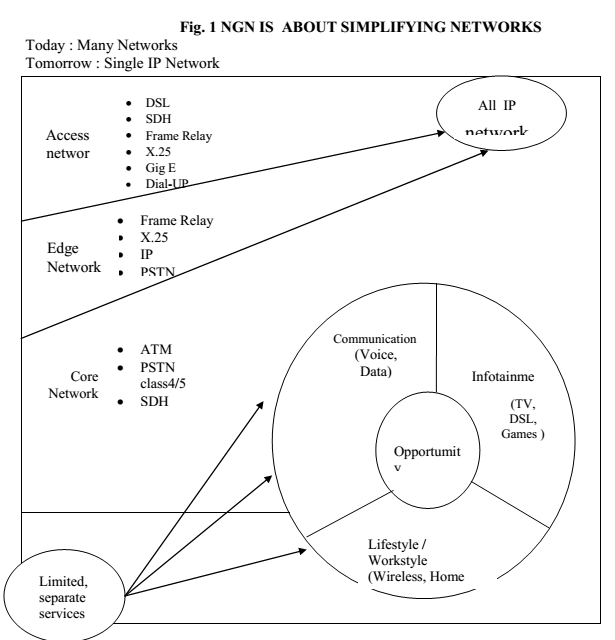 What is Next Generation Networks (NGN)? Why NGN? NGN is about the network infrastructure that will enable the provision of the existing telecommunications services and innovative applications of the next generation. The term NGN refers to a converged network capable of carrying both voice and data over the same physical network, with all traffic (voice and data) carried as IP. The process of realization of NGN will lead to a revolution in the design and build-up of telecommunications network architecture, which will result in a change in the way service providers offer their services and the way people communicate. Ultimately, NGN would phase out the existing legacy networks at a point of time in the future. would lower operational cost and allow greater flexibilities for service innovation and shorter time-to-market. Secondly, the increasing service requirements from end users call for innovative applications / multimedia services, high flexibility of service access, high bandwidth, high quality of service and etc. Apparently, the operators’ need for remaining competitive and the end-users’ demand for increased service requirements are together forming a strong driving force pushing the development of NGN all over the world with characteristics and features that would fulfil the needs of network operators, service providers and end-users. NGN is as much about easier provision of advanced services such as VoIP, Broadband, multimedia applications etc. as it is about cost saving through simplification of network. A migration to NGN will bring about a complete change in the existing business models which is a source of concern for both operators and regulators world over. Historically, incumbent operators typically ran one network — the Public Switched Telephone Network (PSTN). The PSTN was designed to carry voice when voice was the only communication carried. As demand for data communications developed the incumbents adapted their networks to also carry data traffic. However, typically, rather than replacing the PSTN operators typically built new networks that they ran in parallel – which is called the overlay network. These new overlay networks were designed specifically to carry data traffic. As network technology continued to develop, the number of networks multiplied in step. As a result, today, many operators run typically 5-10 different network platforms (ATM, IP, Frame Relay, ISDN, PSTN, X.25 etc.). The problem with this multi-network approach is that it has created a web of complexity resulting in management complexity, operational inefficiencies, maintenance issues and duplicating capex. Next Generation Networks aim to reverse the clock and go back to the simplicity of one single network. NGN is all about deploying one network platform capable of supporting all traffic types while facilitating service innovation (Fig. 1). ITU defines Next Generation Network (NGN) as “a packet-based network able to provide telecommunication services and able to make use of multiple broadband, QoS-enabled transport technologies and in which service-related functions are independent from underlying transport related technologies. It enables unfettered access for users to networks and to competing service providers and/or services of their choice. It supports generalized mobility which will allow consistent and ubiquitous provision of services to users”. It is believed that the rapid and widespread growth in the use of the Internet has become the catalyst to the fostering of such a concept of NGN. With Broadband access service becoming increasingly popular, easily accessible and more affordable to any corporate entity and individuals, more and more applications and services have been developed and evolved based on the IP technology of Internet, varying from narrowband voice telephony services (i.e. VoIP) to broadband applications such as high-speed Internet access, video conferencing, multi-casting of TV programmes and etc. The increasing proliferation of IP-based services has in turn driven the rapid development of packet-based networks in the access, transport and core layers of the telecommunications infrastructure in order to cater for the drastic increase in the volume of IP traffic. Such a change in telecommunications services brought about by the Internet has paved the path and laid a foundation for the development of IP-based NGN. From a high-level perspective, Next Generation Networks rely on three main principles. First of all, NGNs are implemented in such a way that the functions performed by the network are separated into functional planes. These functional planes include access, transport, control & intelligence, and service layers. Layers are independent in the sense that they can be modified or upgraded regardless of other functional layers. This layered architecture provides a flexible and scalable network, reducing time to market for the implementation of new services. Moreover, the functional planes are separated by open interfaces in order to facilitate the interconnection to other operators’ networks but also the integration of third-parties’ services and applications. Provided that commercial agreement is reached between the different parties, such a principle can widen the operator’s coverage and service scope and can also provide end users with an access to a greater number of services. Last but not least, NGN is a multi-service network meaning that an NGN can be used to provide many services, as opposed to legacy networks that are only used for specific services. This multi-service network enables operators to implement converged and new services in addition to POTS. From the users’ perspective, the convergence of services will enable the emergence of the seamless service concepts, where users can access their “desired” services from any type of access network. Along with a new architecture, Next Generation Networks will bring an additional level of complexity over existing networks. The addition of support for multiple access technologies and for mobility results in the need to support a wide variety of network configurations.